The plan of action for pasture management is based on an integrated crop management (ICM) approach to crop production. ICM is a management approach that establishes a diverse and comprehensive system to manage pastures on a field by field basis. A farm manager that adopts an ICM program to maintain pastures and crops utilizes nutrients as needed to maximize productivity; manages weeds, diseases, and insects in an environmental and economically responsible way; and adopts the best cultural, physical and chemical practices to enhance crop production. Site-specific soil tests to determine nutrient levels, allowing for customized fertilization plans. A rotational grazing plan, designed to enhance the growth of forage species by allowing grazed pastures to recover for several weeks before being grazed again. A flexible pasture rotation program to accommodate fluctuating horse populations and herd composition. The use of stress lots or sacrifice areas to accommodate fluctuating environmental and forage conditions. Continual monitoring of forage species and plant density to determine the need for renovation. Development of a plan to over-seed pastures to thicken existing stands and add new varieties when needed. Continual monitoring and identification of weeds. Adoption of a weed management program which includes mowing, increasing forage productivity to compete with weeds, and proper chemical control when necessary. Development of a comprehensive nutrient management plan (CMNP) in order to determine site-specific recommendations for manure storage, composting, and spreading. 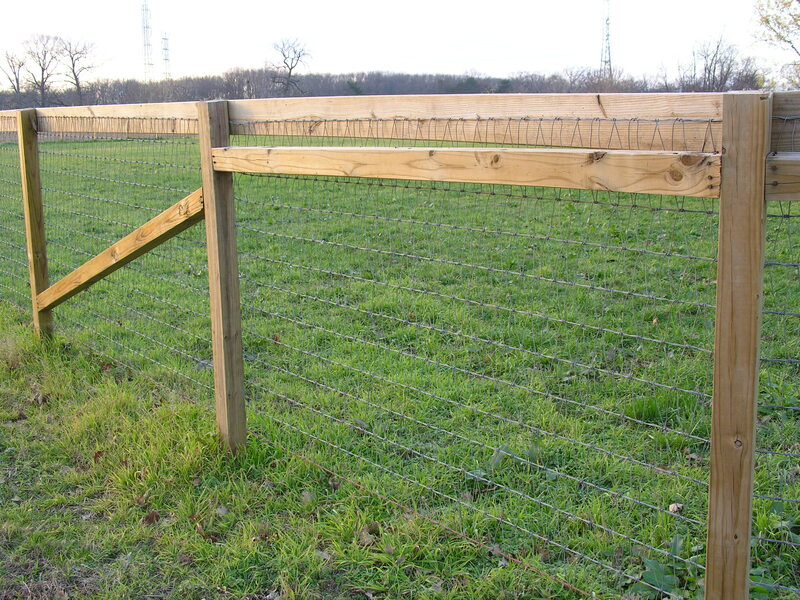 The mesh in the fence is small enough to prevent horses’ hooves from getting through, thus preventing injury. The mesh can be purchased in a few different heights. At our facility we have both 4-foot and 5-foot heights. This gives the farm an option to extend the mesh about 2 inches above the top board to prevent wood chewing. The 5-foot height can also be placed just above the ground to prevent outside intruders (e.g. children, dogs, etc.) from entering the pasture. The top board on the fence allows for more visibility and durability. If necessary the farm can decide to place a strand of electrical wire in front of the top board to prevent wood chewing or fighting over fence lines. The mesh at the bottom of the gate prevents horses’ hooves from getting through, thus preventing injury. The mesh and bars of the gates allow for more stability and prevent horses from being able to stand on the lower bars, which would create a sag in the gates’ alignment. 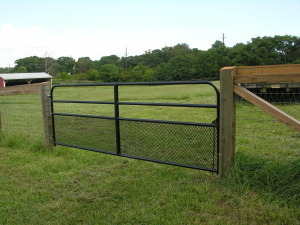 The gates come in multiple sizes so you can tailor each gate to your farm’s needs. In order to facilitate adherence to best management practices, including the overall nutrient management plan, the Ryders Lane BMP Team recently purchased a utility tractor. The new utility tractor is equipped with a front-end loader, a 60” rear mounted finish mower, and a PTO-driven front mounted snow blower. The front-end loader will be used routinely for manure management, moving gravel, loading the manure spreader, and general maintenance at the Ryders Lane facility. The new finishing mower will be instrumental to pasture management. With the addition of approximately 15 acres, the facility now comprises approximately 30 acres of pasture. Previous pasture management plans involved mowing with a brush hog. The new mower has an adjustable height between 1 to 5 ½ inches and is equipped with wheels to help prevent pasture scalping. Clearing even a minor snowfall from feed lanes is often a challenge. The addition of the front mounted snow blower attachment will enable us to clear feed lanes quickly, so that horses can be fed in a timely manner. The New Jersey Agricultural Experiment Station (NJAES) offers information on horse pasture best management practices, including pasture forage species, soil fertility, weed control, toxic plants, site considerations and more. For answers to specific pasture management questions, visit “Ask the Expert”.